It used to be pretty common in the business world to hear the phrase “The future is digital.” You don’t hear that so much anymore, though. That’s because the future is now. Business in the 21stcentury has been almost entirely transformed by the rise of cheap data storage, processing power, and the increasingly ubiquitous connectivity of the internet. No matter how traditional the managers are or what the industry is, there just isn’t any company in business today that hasn’t been touched by the trends introduced by information technology. And there’s no business that will still be open tomorrow if it doesn’t adjust to keep pace with the rapid evolution of that technology. Wireless, cellular, mobile, big data, and social media are all continuing to push the boundaries of how business is done. And not far down the road, you can see artificial intelligence looming as the next wave ready to break across the shifting sands of the markets. They are all trends that demand business leaders with a powerful command of not only commerce and financial matters, but technological considerations as well. That’s why a master’s of business administration with a specialization in information systems management is one of the most valuable degrees you can earn today to guarantee relevance and success for the rest of your career. Like any in-demand specialty, MIS concentrations have sprouted like weeds in recent years. There are so many, in fact, you might feel like you’ll need to deploy some of those advanced analytical skills before even starting your program just to pick the right school. Smart applicants will start with an outside screen, the kind of algorithm that coders use to sort data. One of the best filters is to simply start with a review of the accreditation status of the program. Any university worthy of the name is already going to have at least a general accreditation from one of the major regional or national accreditors recognized by CHEA, the Council for Higher Education Accreditation or the U.S. Department of Education. It’s pretty much a given that the university meets such basic standards. But you had better choose one that does—which is why we’ve held every school on this list to that standard. These organizations take the basic principles of accreditation and apply it to the elements of business education. Through document review, interviews, and site visits, they look into the policies and practices of the MBA program to validate them against the standards of the international business community. Through close relationships with both academic and commercial organizations, they keep close tabs on what businesses want to see in MBA graduates, and ensure that the programs they approve deliver those qualities and skills. Knowing what you are doing as an IT executive is a stark binary state, just like IT itself. If an application is expecting a one and gets a zero, you’re out of business. There’s not a lot of room for ambiguity or nuance. A finely-tuned press release or getting motivational t-shirts printed up isn’t going to paper over it. When you go into IT management, the people you are managing are going to know whether or not you have a command of the material… and do you want to guess how much respect you’re going to get if you don’t? That’s why it’s important to sweat the details when you’re considering what school to choose for your IT management MBA concentration. You need a program that hits just the right note of balance, offering a rock-solid core business education while covering enough cutting-edge technology to give you all the knowledge you need for the job. We sought out programs that avoided the basic platitudes and buzzword-heavy course titles in the specialty in favor of schools that offer gritty, focused technology courses in IT theory and current practice. The more up-to-date the curriculum, the better. Technology changes quickly, and schools that keep up were definitely put in the running for our list. Naturally, every program we selected has at least some online components. You don’t go to a mechanic who doesn’t change his own oil and you don’t get an IT concentration at a school that can’t put together an internet-based classroom. But not all online course content delivery systems are created equal, and one that is lacking in it’s ability to engage students and allow them easy access to course materials and the ability to interact with instructors can really compromise the student experience and the effectiveness of the program. That’s why we kept an eye out for programs that make the quality and efficacy of their course content delivery system and student interface top priority, and gave the schools that did a second look. We also looked for business schools offering experiential learning opportunities. Whether it’s a placement in a real business as an intern or a capstone course that involves consulting on a real-world tech implementation project, anything to help you get your hands dirty in the field is a plus. Along the same lines, programs that offer technical courses in coordination with a school’s information systems department also rated highly. There, you can study side-by-side with many of the technology professionals you’ll be working with out in the real world. If a school also had partnerships with outside tech vendors like IBM, that got a big thumbs-up, too. Basically, we did just about everything for you here to narrow down the right MIS concentration except fill out your application. So what are you waiting for? Although technically the school is an element of the larger California State University system, you’ll find pretty much everyone just calls it “Fresno State.” So will you, after you see how exceptional their MIS emphasis courses are in their online MBA program. The emphasis on applied and experiential learning sets the program apart by combining real-world examples of information systems use in business environments with the strong managerial and financial skills that make for capable executive leadership. Alumni network can put you in touch with almost 40,000 graduates. It’s true that information systems infuse every aspect of modern business operations today. To be a competent modern executive means being well-versed in the language and concepts of information technology. But IT doesn’t stop there, and neither should your education. That’s why Pepperdine’s Digital Innovation and Information Systems concentration in its online MBA program is such a great find. Instead of hitting the minimums in educating you about the rote function of MIS, Pepperdine takes the intuitive leap by going into the use of technology as a force for innovation. You’ll get all the same analytics, architecture, and project management training you could find in any MIS MBA concentration, but then you’ll move to the next level by learning about project inventory considerations, process analysis, innovation and strategic transformation. When you come out the other side, you’ll be well-equipped as a visionary as well as a competent technology executive. An MBA with MIS focus is a balancing act. Information technology is a specialty field that itself requires years of advanced training and practice to master; three courses in an MBA concentration can never make you an expert. But the UCLA technology leadership specialization has the right approach—it builds on the intersection between managerial acumen, business strategy, and technical knowledge to create graduates who have the ability to innovate and excel in IT management. The concept is so important that it’s the sole work of the Easton Technology Management Center at the school, which incorporates field studies and partnerships with technology companies in various verticals like retail, high-tech, and defense. The result are candidates that are actively courted by major employers like Amazon, Apple, and Google. With either international business experience delivered through the Global Access Project capstone, or real-world startup experience in the Business Creation Option, you will have everything it takes to succeed in at such high-caliber companies. The MBA in Management Information Systems through Wilmington University is where you’ll enhance your analytical, decision-making, and communication skills while advancing your knowledge of IT strategies in the areas of analysis, modeling, and design. It’s also the ideal program for working professionals like you, thanks to its fully online delivery and flexible scheduling. You’ll also benefit from the program’s esteemed faculty of active practitioners who serve not only as instructors but mentors, as well as the outstanding environment created by a class of like-minded professionals. 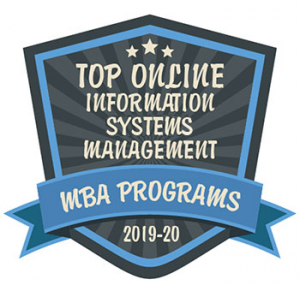 Complete the MBA in Management Information Systems and you’ll dive deep into topics like IT policy and strategy, data communications and networking, data management, and project and change management. As an online student, you’ll feel engaged and connected from the beginning, thanks to Wilmington’s online learning orientation and support by their online student navigators. Florida Institute of Technology’s MBA in Information Technology Management features everything you’d want in an MBA program: a fully online delivery to accommodate your professional responsibilities and a well-rounded, robust curriculum to take your career to the next level. Located in the esteemed Nathan M. Bisk College of Business, the MBA in Information Technology Management features in-depth study in the core business disciplines of finance, marketing, management, and economics while also focusing in on the high-level technical and business topics you’ll need to navigate the complex issues associated with managing data in a global environment. In addition to its fully online course delivery, you’ll benefit from the College of Business’s esteemed faculty who bring real-world experience to the classroom. You’ll also have opportunities to expand your business prowess through the university’s Center for Entrepreneurship and New Business Development. It’s here where you’ll be able to launch a business, receive mentoring by industry experts, and even gain consulting experience through the completion of a semester-long project that involves a real-world business experience. As an MBA student here, you’ll also complete a capstone strategy course that involves the completion of industry and company research. FSU is a powerhouse in Southeastern American MBA programs so you won’t be surprise that their MIS specialization also blows the socks off the competition. With access to the full set of curriculum options available to a regular MS in MIS student to fill your specialization requirements, you can tailor your degree to hit any silo within the vast spectrum of modern technology. But it’s not just technology training. You still get the same full roster of general MBA education to hone your business skills as any other MBA student. That includes a global business seminar culminating in an overseas trip to build your international business acumen. Georgia Southern built this MBA program to produce career-ready professionals who have the knowledge, critical-thinking skills, and tools to succeed in any industry. Today, those tools necessarily include a heavy helping of high technology. That’s why the school now offers an information systems concentration option to MBA students, to expand your toolset for applying all the terrific management techniques you will learn about in the rest of the program. If you’re going to get an MBA with a specialization in technology management, then you had better find one that has a strong command of information technology subjects, and they’d better have the chops to offer high-quality courses online. AIU covers all the bases with their intellipathlearning management system, a smart platform that figures out what you know and focuses instead on what you don’tknow. With options to attend time-shifted courses online or at one of two campuses in the south, your flexibility is maximized while you are getting heavy doses of MBA -skills in accounting and management alongside tech-heavy courses in project management and organizational planning. DeVry is a big name in online education and you can expect big things from their MBA program with an information systems management concentration. The school emphasizes practical skill development right out of the gate, giving you experience in hands-on information technology practices like network design and development, system upgrades, and systems deployment. Tied together with strong management theory and practice education focused on enterprise-level strategies, your new skills in systems analysis, databases, and networks will impress organizations of every size. You’ll also pick up top-notch problem-solving skills that you will develop collaboratively with other students, giving you the team-building experience and knowledge that big information systems organizations covet. Impassioned professors help make the MIS concentration at Purdue Northwest an outstanding pick for executive IT education. The college gives students an opportunity to develop useful managerial skills in the highly technical specialty field through courses covering topics such as decision support and expert systems, advanced e-business applications, and advanced system analysis. On top of a core of standard MBA fare in marketing, accounting, and analytics, you’ll leave Purdue Northwest well-equipped for a career in MIS management. Information systems make the business world go round today and any executive who hopes to have a handle on operations has to have some IT comprehension. But for executives who want to lead an IT organization in a major company, the details and expertise in technology have to go further and deeper. That’s where the information systems specialization at Iowa State steps in. With courses in data management, e-commerce, business software development, and telecommunications, you get the technical details on top of the organizational and project management skills required to build a responsive, thriving IT shop. Grantham University’s MBA in Information Management is where a comprehensive MBA core meets the most contemporary topics and trends in emerging technology. Pursue the MBA in Information Management and you’ll start with a foundation of organizational behavior, quantitative analysis, HR management, finance, and micro/macroeconomics and add in-depth study in areas like marketing management, strategic management, and information systems strategic planning. You’ll also complete a capstone course that involves working on a number of projects with your peers. This program can be completed in just 24 months. Or, if you’re an experienced business professional or you have completed an undergraduate business degree, you may qualify to complete this program on an accelerated basis, allowing you to earn your MBA in just 12 months! As an online student at Grantham, you’ll always enjoy the best in online support, thanks to dedicated student advisors who are there to guide you along your educational journey and provide you with the one-on-one assistance you need to experience the best success. Campbellsville University ranked among the most affordable Christian colleges in the U.S.
Campbellsville University’s fully online MBA in Information Technology is where you’ll solve the complex business challenges of tomorrow in a Christian environment and through a fully online course delivery. As a student of the MBA in Information Technology, you’ll benefit from an entirely online program that features accelerated, eight-week courses. You can complete this 36-credit program in just two years! In addition to a solid MBA foundation that covers advanced strategies and techniques in foundational business areas, you’ll dive deep into IT areas like infrastructure, security, threat management, accountability, risk diagnosis, wireless security, and more. As an online student here, you’ll study in a dynamic learning environment while learning from an esteemed faculty with real-world experience. Do you have previous work experience or an undergraduate business degree? Consider the Professional MBA with IT Track, designed to advance in your career and prepare you for further study at the doctoral level. Ready to advance your leadership or management position? Consider the MBA in Information Assurance or Information Technology through Capitol Technology University. Explore topics in leadership and communication through the program’s solid MBA core and then dive deep into the use of innovation and technology to solve business problems. With a focus on convenience and flexibility for adult learners like you, both of these MBA programs are offered entirely online, with accelerated, eight-week terms designed to accommodate your busy life. Just a few of the other reasons why Capitol Technology University is tops for working professionals include: an outstanding faculty of experienced practitioners…classes of like-minded professionals that encourage outstanding communication and collaboration…and comprehensive career services and resources. Want to get a taste of online learning before committing to an MBA? Consider attending a free virtual info session that allows you to experience CapitolLIVE!, the university’s interactive online classroom. Lincoln U puts MBA students through the paces of learning the core elements of accounting, finance, and marketing before sending them off into MIS emphasis courses to figure out how to use applied technology to tackle the traditional problems of commerce. Looking at web-based technologies as they are commonly applied to modern business problems, you’ll get advanced exposure to cutting edge tools of internet and network security and artificial intelligence that are only just now becoming common in business. That puts you ahead of the curve before you even get to the integral MIS internship course that puts you into a live work setting in a business or government environment to put your learning into practice. NJIT is up-front about their approach to management education: they believe that knowledge of technology is critical in the success of any business. The school builds leading-edge concepts directly into the core MBA curriculum, eschewing trends and fashion for solid, essential principles of applied technology in management practices. So you’re starting out with a high-tech edge as an MBA student at NJIT in the first place. But when you select the MIS concentration, you’re getting a light-speed boost in knowledge and techniques for applying technology to management issues, and for managing the ubiquitous spread of technology itself. Professionals who are aiming for executive leadership positions in IT organizations can’t miss a beat—they have to have both the traditional aspects of management and the details of modern technology down cold. Graduates from NJIT are on point in both areas and are hot commodities for executive recruiters looking for MIS leadership candidates. ECU offers a truly customized program of instruction for every individual graduate student in the MBA program. There are no cohort or pacing requirements—you take the courses you want with the schedule that works best for you. While you’ll be exposed to the same broad range of courses as you’ll find in any professional MBA program in the country, the MIS certificate at ECU will offer you a deeper command of the vital technologies underlying the modern business world. Strategic IT applications and technology project management are killer app skills for today’s business executives, and you’ll gain expertise in all of them as an ECU Pirate. As one of Lake Erie College’s newest offerings, the Online Parker MBA in Information Technology Management offers the best in flexibility and convenience for working professionals like you. Rolling admissions allow you to begin your MBA in August, January or May, while the fully online delivery allows you to balance your professional and personal responsibilities with earning your MBA. As a student of the Parker MBA, you’ll be eligible for Lake Erie College’s outstanding career resources through the Office of Career Development, which include everything from networking events to resume and career search assistance. Plus, you’ll be eligible for Lake Erie’s Lifelong Learning Guarantee, which allows you to take free courses for the rest of your life. For IT management professionals like you, the Online Parker MBA in Information Technology Management offers a truly comprehensive and robust program of study, thanks to a solid MBA core and in-depth study in areas like data and database management, information systems design and development, data communications, and more. Saint Francis University’s MBA in Management Information Systems offers the flexibility your busy, professional life demands, the convenience of an online course delivery, and the same, quality program offered on campus. In short, this graduate course of study has everything you need to expand your career opportunities in today’s ever-changing business environment. While you’ll be studying at a distance, this program remains interactive and hands-on, thanks to video lectures and frequent communication and collaboration with the program’s esteemed faculty of experienced practitioners. As a student of the MBA in Management Information Systems, you’ll not only receive an in-depth education in business skills, you’ll also acquire the general business information systems acumen you need to succeed in the areas of programming, database management, e-commerce, project management, and networking. Plus, as a student of the Shields School of Business, you’ll have opportunities to apply your classroom skills to real world projects through the university’s Small Business Development Center, academic clubs like Enactus, and through optional internships. Ship does its best to prepare students to land on their feet in a rapidly shifting global economy. Nowhere is this more important than in the technology industry, where global standards evolve rapidly and demand strict adherence for both efficiency and security. The MIS concentration delivers with courses on database design, information analysis, and information system project management. When you’re taking a technology-heavy concentration in any MBA program, you want to be sure that you’re working with people who know how to use technology themselves. Ship delivers here with an online component that stands tall among many bigger and more expensive programs. All class meetings are recorded for later consumption or review. Flexible test-taking gives you the option of taking tests online or at a proctored location convenient for you. Charleston Southern University has been ranked among America’s best college buys, America’s best Christian colleges, and among the best schools for veterans, and its MBA in Management Information Systems builds on this tradition of excellence, offering a comprehensive, 33-credit program that offers the finest in flexible, online learning. Small class sizes, experienced professors who serve as scholars in their field, and the option of sampling an online class before you enroll are just a few of the perks of this program. You’ll complete this program in an asynchronous environment, which means you’ll be able to study wherever and whenever it’s most convenient for you. In addition to a robust MBA core, you’ll focus on topics like database design and management, information systems analysis and design, information systems concepts, data security, and more. A technology-heavy university is always the best place to pick up an IT management-focused MBA, and WGU fits that description perfectly. Designed from the ground up as an entirely online university, the school administration and faculty have had to master high-tech from the word go. That expertise shines through in the IT management concentration of their master of business administration degree, which is just dripping with real-world IT experience. Designed with input not only from professional instructors with backgrounds in the field but also a business-based advisory council, the curriculum incorporates elements that IT management spins on but that don’t often get a lot of glory in other programs… project and financial management, strategy, and leadership of engineers and computer scientists. Being able to speak the language is half the battle, and you’ll get the exposure you need through the WGU program. A comprehensive capstone project at the end of the program ties it all together and offers a portfolio project that you can use to demonstrate your value to future employers. You can’t throw an external hard drive in America without hitting a business school that offers an information systems concentration for their MBA program. But it’s a lot more unusual to find a school that builds that IT focus around the unique needs and perspectives of small business. Regent does exactly that with their Small Business Technology Management concentration, and it hits the mark. Small businesses and startups are chronically underserved by professional technology management. Yet they can also benefit most from the efficient application of technology, using it to stay small and efficient and responsive, outmaneuvering larger and more cumbersome organizations. Regent gives you the tools to apply effective IT and business management strategies in the small business, from hardware and architecture to social media and database concepts. It all fits in with the School of Business & Leadership’s approach incorporating entrepreneurial vision and agility into all of their master’s degree programs, and it’s an edge on your skills that will serve you well in businesses large or small.